Austrian field trial is meant to test and evaluate the performance of the INCREASE local control for mitigation of voltage unbalances. For the purpose of the field trial, Energienetze Steiermark (ENS) provided a PV installation, located at the roof of their main administration building in Graz. More specifically, the PV inverters, located at the 10th floor were used. 6 single-phase inverters provide a nice playground to test mitigation of the voltage unbalances using controllable PV inverters with INCREASE unbalance control. Basic concept of the Austrian field trial is depicted on the figure above. 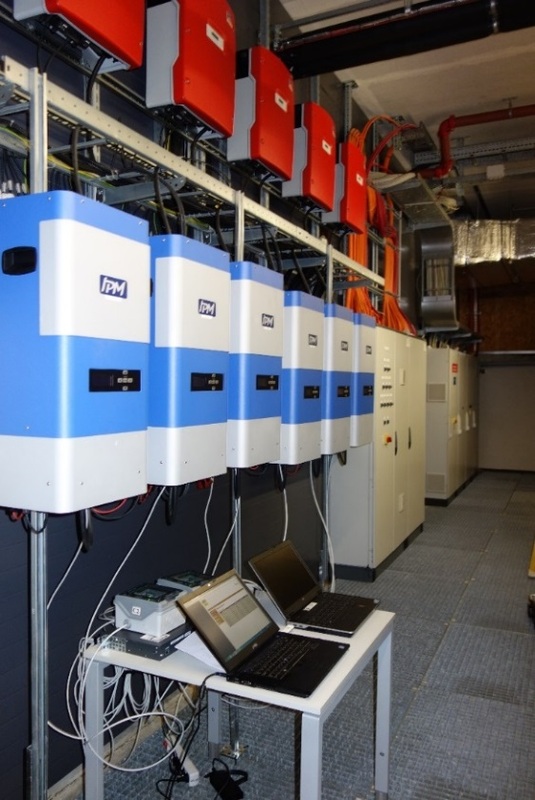 Four of the existing single-phase PV inverters have been reconnected to the same phase in order to create voltage unbalances, which are then tackled by INCREASE three-phase balancing inverters, which were provided by the project partner ILPRA from Greece. Test site set-up, after deploying controllable three-phase inverters, is provided as seen in the figure below. Each of the controllable three-phase inverters consists of three single-phase inverters. The measurements from connection points of the controllable inverters were stored at the local computer. In addition, ENS deployed a monitoring device at the main bus of the 10th floor in order to monitor quantities such as phase voltages and currents, and most importantly the neutral current, which was used as an indication of voltage unbalance reduction. The measurements have been acquired for a longer period of time and aggregated by KORONA, using their Data management application, developed within INCREASE project. KORONA performed a processing of the measurements from the grid and evaluated the impact of INCREASE local control for mitigation of voltage unbalances. 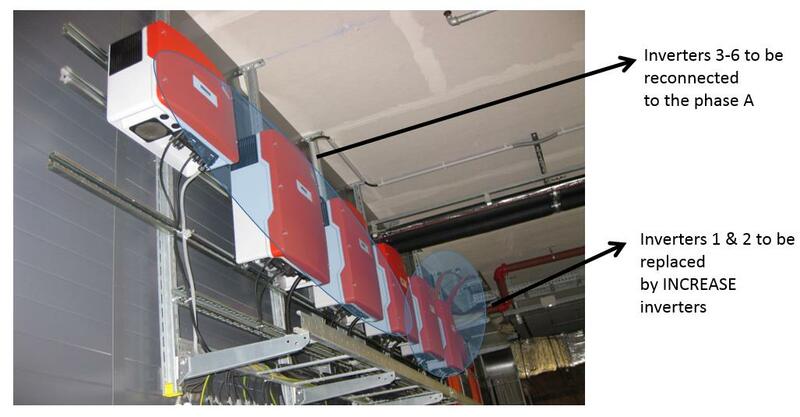 First, the phase voltages at the main bus of 10th floor were analysed (see graphs above). The graph above on the left represents phase voltages for Control OFF scenario. Due to high PV feed-in into the phase L1, significantly higher voltage of the phase L1 can be observed, compared to the phases L2 and L3. High voltage unbalances are created. In case of Control ON scenario (graph above on the right), voltage unbalances are slightly reduced. 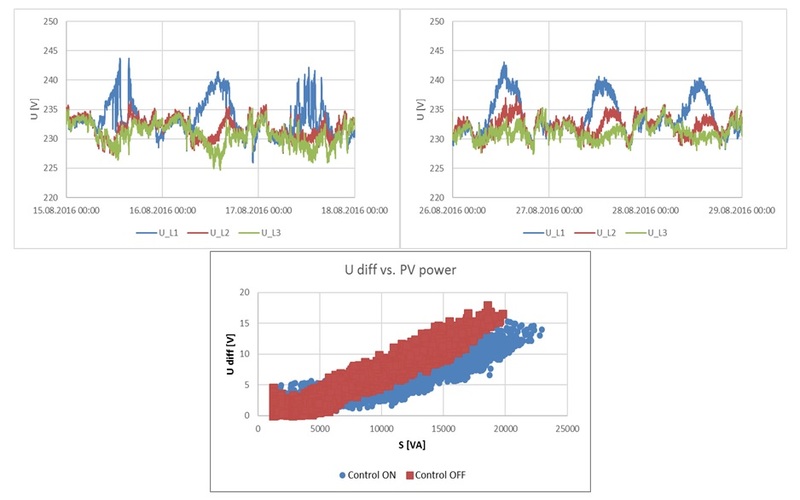 Impact of the INCREASE local control for voltage unbalance mitigation can be noticed by comparison of correlation between phase voltage differences and PV power injection (third graph above). As can be noticed in case of Control ON scenario, voltage differences are reduced up to 5 volts at the same amount of PV feed-in. Further evaluation of the unbalance mitigation by INCREASE local control was made by comparison of phase and neutral currents of the main line of the 10th floor (see the graphs below). 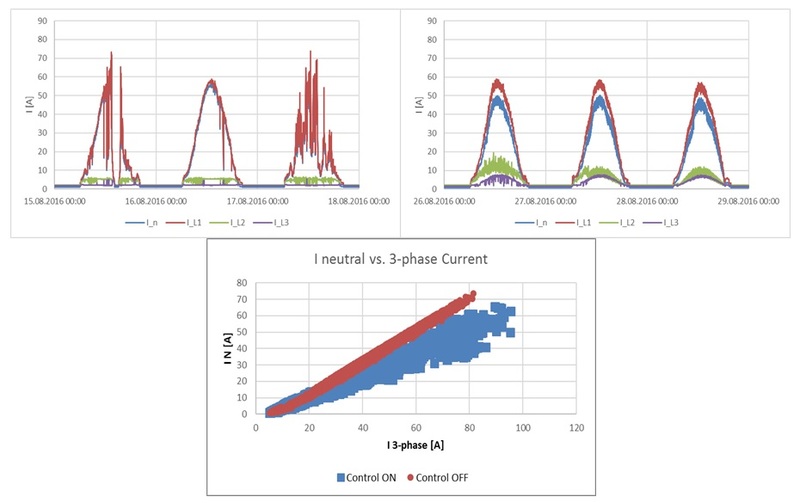 If one compares the phase currents, it can be noticed that in case of Control ON scenario (right graph below), the current unbalances are reduced, controllable inverters increase the PV feed-in into the unbalanced phases L2 and L3. Furthermore, the neutral current (blue line) is reduced for about 10 amps, compared to control OFF scenario, which further confirms proper operation of the controllable inverters. Adequate performance of the controllable inverters is additionally confirmed on a third graph, where correlation between neutral and three-phase current of the main line of the 10th floor is compared for Control OFF and Control ON scenario. It can be noticed that the neutral current was reduced for approx. 20 amps. The Austrian field trial confirmed proper operation of the INCREASE local control for mitigation of voltage unbalances. The INCREASE consortium is very satisfied with the first results from the field. Final results of the Austrian and also other INCREASE field trials will be available very soon, in a Deliverable 4.5, so please keep checking the INCREASE web site to receive most up-to date information.